I was interested to read Andrew Hodges recent post on Cary Grant and his appearance in the film ‘To Catch a Thief’. Of all the iconic looks in that film, the one most frequently referred to is that of Grant in a crew neck blue and white striped Breton and sporting a foulard neckerchief. If there is one thing I share in common with Cary Grant, and I’m sorry to say there is only one thing, it is having to pay particular attention to our necks. At the age of 14 Cary Grant, or Archie Leech as he was then, ran away from home to join a troop of travelling vaudeville acrobats. His father retrieved him but this didn’t stop young Archie, and he soon made his way back. After much cajoling and a promise by the troops impresario to watch over the young lad, his father reluctantly permitted him to stay. This early physical and rather punishing career provided Grant with a body that was muscular and lithe. It also provided him with a size 17.5 inch neck and a drop shoulder. The need to compensate for these physical defects, as well as a large head, meant he developed certain sartorial traits, which he retained all his life. In particular, shirts had deep soft collars with shallow stands, which de-emphasised the width of his neck. He was rarely filmed without a jacket or with an open collar; if he were he’d often do up the top button and flip his collar. In Alfred Hitchcocks To Catch A Thief, the famous neckerchief was once again used to de-emphasise his neck, and resulted from agreement by both Grant and the wardrobe department that the sweater alone didn’t quite work. I said we shared something in common. Well, I don’t have a 17.5 inch neck, but I do have a long neck which at 15.5 inches and attached to a chest of 42 inches is ill proportioned – and I’m a big head. Just as Grant did, I use collars to correct this aesthetic hiccup. In my own case I use deep Collars with high stands such as those provided by my shirt makers Stephan Haroutunian and Nino Santoro. The high stand helps to foreshorten my neck, and the broad collars add weight and width. This covers more formal situations, but it requires a little more thought for informal dressing. And this leads me back to the neckerchief. Ideal for crewneck sweatshirts or T-shirts, I also use them to add some weight and proportion when wearing polo shirts or even open soft collars. Previous Post What? No Tie? I have a big head too. It is hard to find stylish neck and headwear that fits big heads. Collars i an interesting way to distract form the big head. I started shopping at Lamood Big Hats. They actually make big hats for big heads at http://www.lamoodbighats.com. Hats are real nice. What is the best way to tie a neckerchief? Any other advice on how to wear one would be most welcome. Thank you. The other way is to tie the knot and then tuck the ends back under the band. Living in the “Wild West” at the End of the Oregon Trail, this is how the buckaroo cowboys fold a neckerchief. Take two opposing corners and fold them to the center until the tips just touch, then fold each side again in half until each side is about 1 inch wide. Then fold the two sides over on top of each other. You’ll end up with a nice even fold without that silly little tongue hanging out of the center of the neckerchief. Lastly, tie the ends around your neck with a standard square knot. 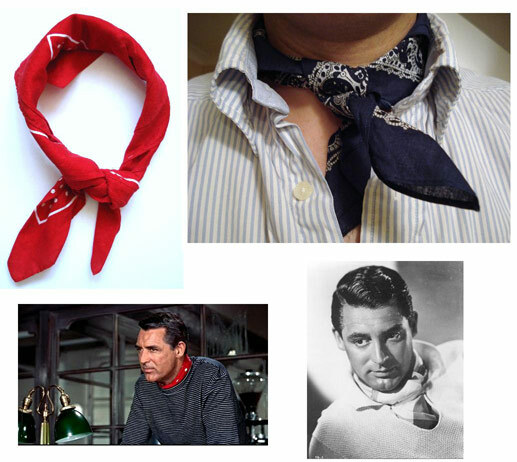 for a cleaner “Cary Grant” look, tuck the two end pieces under the back side of the neckerchief. Now you are ready for either the French Rivera or the rodeo!